We don’t go out to eat very often, but when we do, we always seem to go to Wendy’s. My husband secretly loves the Jr. Bacon Cheese Burgers! I will usually get a salad and try to choke it down while I watch my husband eat his delicious burgers. The last time I went to Wendy’s I tried the Apple Pecan Chicken Salad and LOVED it! I loved it so much that I decided to make my own version of it! Hope you like it! 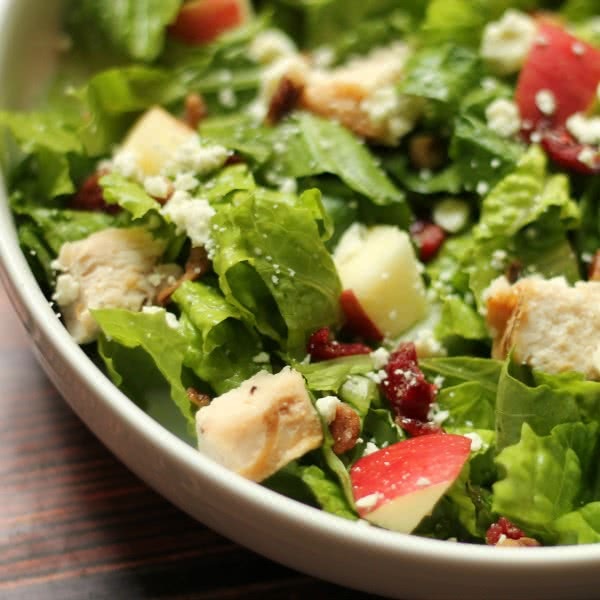 This copycat apple pecan chicken salad is my favorite go-to salad! It's so easy to hurry and throw together and makes a great lunch! Mix all ingredients together in a large bowl. Serve with your favorite dressing. Wendy's uses a pomegranate dressing, and that's what we love to top it with, too! I love this type of salad but did not care for the blue cheese. What would you recommend for a substitute for the blue cheese crumbles? Smiths now carries the dressing that comes with that salad at Wendy's. It's Marzetti's Pomegranate and is found in the refrig setions at Smiths. I haven't seen it at any other grocery store! How do you make the roasted pecans wendys has on their salad? Or can they be bought. They are kind of sweet with some sort of coating. Thanks in advance. You can buy this dressing at supermarkets that carry the Marzetti brand....that's who makes it.